Our study provides a survey of the state of the relationships currently established between human rights and climate change. It examines the external diplomacy of the European Union in the fields of human rights and climate change. The relationship between these two fields is addressed from two different perspectives: the integration of the climate change topic within EU human rights diplomacy; and the inclusion of human rights concerns within EU climate change diplomacy. We analyse its effectiveness, efficiency and the interrelationships with the EU’s external development policy by showing, where appropriate, their coordination, coherence and mutual support. In this respect, special emphasis is put on migration issues. 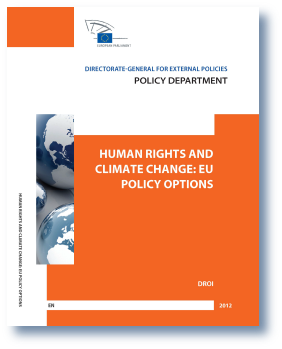 Our study then turns the analysis towards internal EU climate change policies, which are explored from the perspective of human rights. We assess the compatibility of European Union mitigation policies with human rights and the gradual integration of the EU adaptation framework within other key European Union policies. Finally, this work concludes with a clarification of how the environmental human right to public information and participation in decision-making, which is transversal by nature, appears and may evolve in both EU internal and external climate policy.